This post has been edited for content. Have you been wondering why Bob Cox hasn’t posted on OlbermannWatch lately? He appears to be busy with other things. Earlier this month, Associated Press announced that a select group of bloggers would receive access to the Scooter Libby trial. Cox’s group, the Media Bloggers Association, trumpeted it as a victory for bloggers across the nation. 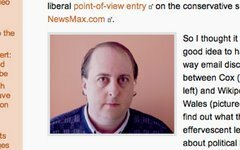 Cox is apparently focusing at least a portion of his non-OlbermannWatch efforts at creating a blogging "elite." A group called the Media Bloggers Association, led by veteran blogger Robert Cox, is pushing for greater professionalization among blogmasters through training about legal and ethical obligations. In time, Cox suggests, bloggers might be less likely to succumb to the pleasing fiction that they can work at the same time as political operatives, Web entrepreneurs and independent commentators without compromising something of value. In the context of this discussion on ethics, it may be useful for someone to write the author of the article a letter to refresh his memory about Bob Cox's work on OlbermannWatch. The reporter, Edward Wasserman, is Knight professor of journalism ethics at Washington and Lee University. His email address is edward-wasserman@hotmail.com. But back to the point. If you are training a professional “elite” of bloggers to cover major news stories, aren’t you going against the egalitarianism that makes blogging such a powerful medium for the transfer of information? That doesn't make sense for an organization whose ostensible purpose is to promote blogging. It may suggest that Bob has other ambitions. His style would certainly would be consistent with that found in any college marketing textbook. For anyone who is interested, the process of self-promotion on the internet is so simple that absolutely anyone can do it. * Make your mark on the internet by adhering to a particular party line. * Attack a randomly selected person. * Don’t think of anything new. Realize there's already a script in place. Become the instrument of those in power. * Repeat one line of thought persistently enough to make people think you are either insane or privy to some unique insight (why else would you keep on repeating such drivel) and an audience will gather. Is that media party line a mirror image of the party line of the most powerful political group in the nation? What a coincidence! All the better! The Bush administration has irretrievably fallen from grace. Coincidently, Bob has moved on to greener, more lucrative pastures.